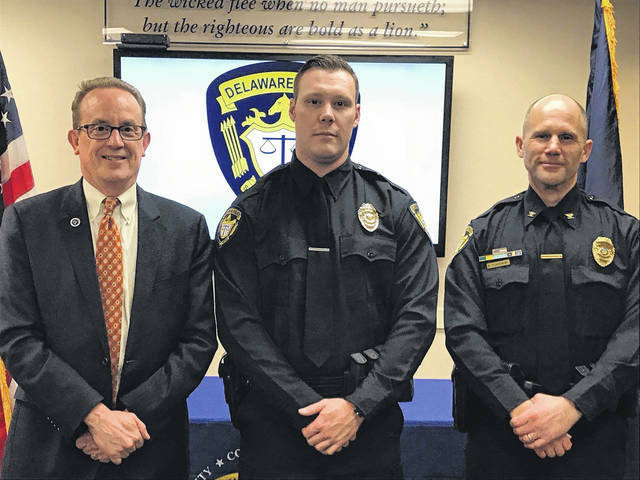 Officer Sam Walter, middle, poses with Delaware City Manager R. Thomas Homan, left, and Delaware Police Chief Bruce Pijanowski, right, after he was sworn in on March 22. New City of Delaware Police Officer Sam Walter said Friday that he’s excited to be a part of the Delaware community. Walter was sworn in on March 22 and comes to the City of Delaware Police Department after serving in the Marion Police Department for two-and-a-half years. Walter said he was drawn to Delaware because of its growth and “beautiful” downtown area. “I’m very happy. I’m very excited to be here, and I’m thankful for the opportunity,” Walter said. Walter added he is very excited to get back on patrol because between leaving Marion and joining the Delaware Police Department, he hasn’t gotten to spend much time on the road. City of Delaware Police Capt. Rob Penrod said Walter was well regarded in Marion and said the city looks forward to having Walter involved with the community. Walter is currently on first shift but will rotate between second and third shift after six weeks on each patrol before he will be assigned to a shift. https://www.delgazette.com/wp-content/uploads/sites/40/2018/04/web1_29063902_827678217420302_8537406780045370279_o.jpgOfficer Sam Walter, middle, poses with Delaware City Manager R. Thomas Homan, left, and Delaware Police Chief Bruce Pijanowski, right, after he was sworn in on March 22.